Perth, Scotland, 2018-Sep-06 — /Travel PR News/ — Stagecoach East Scotland driver Ian Field, 39, who works at St Andrews garage was one of 91 drivers who battled for the ultimate accolade for passenger transport professionals; to be named Bus Driver of the Year at the national finals in Blackpool. He was among five Stagecoach employees to finish in the top 10 best drivers at the competition. Anthony Quinn from Stagecoach West came second receiving the runner up trophy. Ian is the third Stagecoach employee to win the title in the past six years, following the success of William Bradford from Stagecoach London in 2015 and Stagecoach Oxfordshire’s Gordon Cutting in 2013. 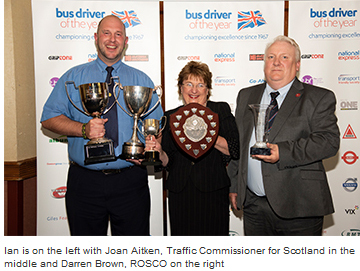 Ian received trophies and cash prizes after being named the competition’s overall winner as well as the best driver in Scotland and the highest rated Stagecoach driver. Ian has worked for Stagecoach for 10 years. He scored an incredible 1528 points out of a possible 1770. Coming second in the overall competition and taking the slot as Best Bus Driver for England was Stagecoach West’s Anthony Quinn. Anthony, 52, based at Gloucester depot walked away with a trophy, cash prize and the overall second place with a score of 1510 points. Also finishing in the top 10 from Stagecoach companies were Graham Hall from South East and based in Hastings who finished in 5th place, David Whitehead from East Midlands who finished 7th and Daniel Baines from Yorkshire who came 10th. During the competition the 91 drivers from bus operators across the UK undertook a series of driving tests in a bid to win the Bus Driver of the Year title. Drivers are required to drive on a simulated route can include any of the hazards normally encountered during their working day. The test is completed on both private and public roads and, as in ordinary operations, drivers are required to keep to schedule. All competitors are also required to complete a combined written test on the Highway Code and Driver CPC Knowledge. This entry was posted in Transportation, Travel, Travel Awards, Travel Services, Travelers and tagged award, Bus Driver, driver, Ian Field, Paul Thomas, Robert Andrew, Rupert Cox, Scotland, Stagecoach, UK, William Bradford. Bookmark the permalink.